Gauteng’s police head promote xenophobia and could provoke violence against foreigners. Blaming undocumented foreign nationals for crime in South Africa is nothing new, despite the lack of evidence to back such perceptions. However the South African Police Service (SAPS) Gauteng Provincial Commissioner Lieutenant-General Deliwe de Lange has reportedly claimed that about 60% of suspects arrested for violent crimes in the province are illegal immigrants. As an experienced police officer, De Lange – we can assume – would not have made the statement without some basis. However, the statement on its own says very little and may simply fuel xenophobic attitudes. What are we to make of this claim knowing that the police don’t publicly release data on the nationalities of those they arrest? Firstly, the commissioner refers to ‘violent crime’. The police do not have a category called ‘violent crime’, but divide violent crimes into seven broad categories: murder, attempted murder, sexual assault, aggravated robbery, common robbery, assault with intent to commit grievous bodily harm (GBH) and common assault. Collectively the SAPS refers to this broad group of crime categories as ‘contact crime’ – as there is direct contact between perpetrators and victims. One could assume that the commissioner means that 60% of people arrested for contact crimes are undocumented foreign nationals. Then we must ask for which specific categories of crime these suspects are being arrested. For the most recent financial year – 2016/17 – a total of 171 466 contact crimes were reported to Gauteng police. Nearly half of these were assaults, which made up 48% (81 767 cases) of all violent crimes reported. Murders made up the least at 2.4% (4 101 cases) of all violent crimes, and aggravated robberies made up 31% of cases (53 793 cases). The detection rate by the SAPS for all contact crimes in the past financial year was 52.28%. The detection rate is determined by the proportion of cases opened where the police identify a perpetrator, or where the case is closed as ‘unfounded’ – when an investigation finds that no crime occurred. The serious violent crimes that most worry Gauteng residents are murder and aggravated robbery. Statistically, these are the most reliable violent crime categories, as they have higher reporting rates than other violent crimes. Aggravated robberies are recorded by the police usually when an armed perpetrator threatens or uses violence against a victim in order to steal their belongings. According to its 2016/17 annual report, the SAPS is able to detect perpetrators in only 23.9% of murders and in 17.9% of aggravated robberies. This means that in more than 75% of murders and in over 80% of aggravated robberies, the police have no idea who the perpetrators are. It therefore isn’t possible to make accurate assertions that undocumented foreign nationals commit most crimes such as murder and robbery. Therefore we cannot assume – as some media reports did – that De Lange was stating that most violent crimes were committed by undocumented foreign nationals. What she said was that most people arrested for violent crimes were not South Africans. We do know that the police have been targeting undocumented foreign nationals as a group. Operation Fiela – launched in 2015 – focused on arresting undocumented foreign nationals. Minister in the Presidency Jeff Radebe said most arrests as a result of Operation Fiela were of undocumented foreign nationals and in the first three months of the operation 15 396 undocumented foreign nationals were repatriated. When the police target particular groups of people, most arrests for violent crimes will be of people who match that profile. The problem with targeting people because of their profile rather than because they are committing specific crimes, is that it has little, if any, impact on public safety. If most people who commit violent crimes are undocumented foreign nationals and the police are arresting large numbers of them, why has this not brought down the level of serious violent crimes in recent years? Over the past five years in Gauteng, the number of murders has increased by 36.9% and aggravated robbery has increased by 53%. This suggests that Gauteng police are targeting the wrong people. If they were effectively targeting and arresting the people who were committing murders and robberies, these crimes would be decreasing substantially. Between 2009 and 2011, the Gauteng SAPS effectively targeted people committing robberies regardless of nationality. They managed to reduce hijackings by 32%, house robberies by 20% and business robberies by 19% in that period. Justice and Correctional Services Minister Michael Masutha said in July this year that only 7.5% of people in South African prisons were foreign nationals. This suggests that most people committing crimes across the country are South Africans and not foreign nationals. While there are undoubtedly foreign nationals committing crimes, there is no evidence that most of them commit crime, or that they are responsible for most crime. While it may not be her intention, De Lange’s statements promote xenophobic attitudes and may provoke violence against foreign nationals. The Provincial Commissioner should make the data supporting her statements publicly available so her claims can be verified. If indeed De Lange’s statement is based on data collected by the police, then we need to understand why the SAPS’ focus on arresting undocumented migrants has not resulted in a decrease in at least murder and robbery. There is an urgent need for SAPS data to be shared better so as to develop more effective anti-crime strategies. Until there is greater cooperation and information-sharing between the police and other sectors of society, South Africa is unlikely to achieve sustainable levels of public safety. Despite its failings, MINUSCA is the only semblance of governance and security in CAR. 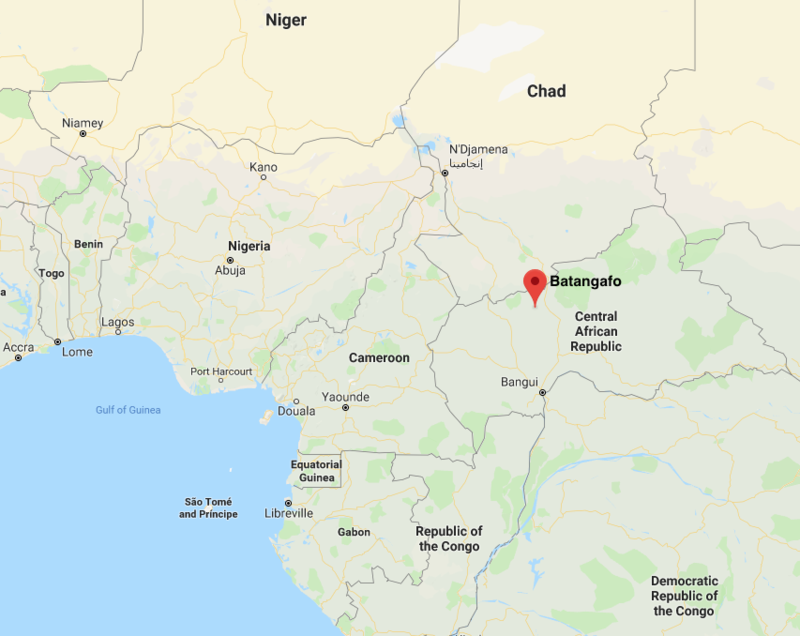 Batangafo is a small, nondescript town of about 20 000 people in north-west Central African Republic (CAR). It’s only a few hundred kilometres away from the capital Bangui, but the perilous roads and the danger posed by the armed groups that patrol them mean the town is almost entirely cut off from the rest of the country. There is no government presence in Batangafo. Since late 2013, when the conflict in the CAR first erupted, local authorities evacuated en masse. They have yet to return. Batangafo too is plagued by armed groups – both the ex-Seleka rebels and the anti-balaka civil defence movement have links there – and most of its population has been forced from their homes. They now live in makeshift camps for the internally displaced, or fend for themselves in the bush. In this context, it is difficult to overstate the significance of the 100-odd peacekeepers stationed in Batangafo as part of the United Nations Multidimensional Integrated Stabilization Mission in the Central African Republic (MINUSCA). ‘MINUSCA is far from perfect, but I can’t imagine what the situation would be like if they were not there,’ says one senior aid worker who has worked in the region. Is CAR fundamentally different from other contexts in which peacekeepers operate? The peacekeepers, from MINUSCA’s Pakistani contingent, patrol the town in pick-up trucks and man key intersections. They are unmistakable in their full armour and blue helmets. They try to respond to reports of disturbances, and protect the dusty runway when humanitarian supplies are flown in. From conversations with civilians affected by the ongoing conflict, as well as with leaders of armed groups, it is clear that the presence of these peacekeepers helps prevent the worst excesses of the armed groups. The job is far from easy. In fact, the CAR may just be the most challenging environment in the world for peacekeepers. It is certainly among the most fatal: 13 peacekeepers have lost their lives this year. The latest fatality was an Egyptian soldier killed in an ambush on Sunday. ‘If you compare with other UN missions in other countries, no country is on a par with CAR. The security dynamics are one thing, and there is no government infrastructure. That is absent. Then there is the presence of the armed groups. No one has taken any sincere effort to disarm them,’ says Lieutenant-Colonel Salman Hassan, commander of Batangafo’s MINUSCA contingent. Here MINUSCA has commandeered the old court building on a hill overlooking Batangafo – a tidy metaphor for their role in upholding the slender remnants of law and order in the town. The compound is now protected with rolls of barbed wire, and by sentries with automatics and machine-gun nests. Hassan insists that his men are ‘doing things differently’ – an allusion, one suspects, to the criticisms that have dogged this peacekeeping mission and its African Union-mandated predecessor, the African-led International Support Mission to the Central African Republic (MISCA). Peacekeepers from both MINUSCA and MISCA have been repeatedly accused of sexual exploitation and abuse, assault and even murder. In one particularly damning episode, Congolese peacekeepers allegedly killed 18 people in Boali between December 2013 and June 2015. The remains of the deceased were only last week returned to their families. These failings were acknowledged and condemned in a recent United Nations Security Council resolution, which also approved the addition of 900 extra troops to MINUSCA to help prevent a resurgence in violence. In Bangui, Parfait Onanga-Anyanga, MINUSCA head and the United Nations Secretary-General’s Special Representative to the CAR, welcomed the extra men – but remained frank about the scale of the challenges faced by his peacekeepers. Speaking from his air-conditioned office in the middle of the sprawling MINUSCA base – what some observers cynically describe as the real seat of power in the CAR – Onanga-Anyanga says it is impossible to operate effectively in a country that is the size of Afghanistan with just over 10 000 troops. Afghanistan, he says, had more than 10 times that number of foreign troops involved at the height of the conflict. The current conflict in the CAR began in 2013, when rebels under the banner of the Seleka movement toppled the government of François Bozizé. That movement has now fractured, as has the loose coalition of anti-balaka groups (civil defence militias) that sprang up to combat them. The result is widespread instability driven largely by local concerns. Onanga-Anyanga argues that the CAR is fundamentally different from other contexts in which peacekeepers operate, in part because of the historic lack of national governance and in part because of the splintering of armed groups which makes it difficult to know who to begin negotiations with. ‘In some places we have a peace to keep. Here we have no peace to keep. Groups are not only fighting each other, but they are fighting us. This place has become the most dangerous for peacekeepers – we lost  just this year. It’s also the most dangerous place for humanitarian workers ... It’s just a brutal war ... It’s just inhumane,’ he says. Brutal or not, Onanga-Anyanga insists that MINUSCA is committed to restoring order in the Central African Republic – even if, as he suspects, it takes more than a decade of consistent international intervention. The last of three stories, Fatuma’s experiences show how strengthening family ties can prevent violent extremism. At first glance, there’s little about her that hints at her experiences. She is young, 22 years old, with wide-open eyes and a smile that, after some initial hesitation, comes easily. She exudes a gentle confidence as she speaks, her voice rising and falling liltingly as she narrates her story. Were it not for the story’s content, it’s unlikely that Fatuma (not her real name) would be mistaken for a woman who had spent time in an al-Shabaab camp in Somalia. Born in Likoni, in the southwest of Mombasa Island, Fatuma’s family’s financial situation was so dire that, at times, food was hard to come by. There was also no money for school fees, and she was forced to drop out in early high school. At 18, Fatuma married. ‘I was married to my first husband for six months before he left for Somalia,’ she says. Soon after his unexpected and unexplained departure, Fatuma was harassed and intimidated by friends of his to get into a car to go and find him. The promise of a reunion with him prompted her compliance more than the promise of employment, which was also assured. She never found her husband – ‘I still do not know if he is alive or dead’ – and was instead taken to a forested al-Shabaab camp in Somalia. Fatuma is one of three female returnees whose experiences informed the Institute for Security Studies’ (ISS) monograph, Violent extremism in Kenya: why women are a priority. The report discusses how efforts to counter violent extremism often neglect women and the role they play in families and communities. As a result, opportunities to engage them in preventing extremism are missed. Life at the camp was unbearable, says Fatuma. Bugizi, a drug made up of heroin, marijuana and Rohypnol, was repeatedly and liberally forced upon her and the other women, and they sustained violent and persistent verbal, physical and sexual attacks. Fatuma’s comment suggests that a non-welcoming response from her parents might have been expected. And indeed, women who have joined extremist organisations, whether voluntarily or forcibly, can face merciless stigmatisation and ostracism from their families, communities and Kenya’s security forces. In this way, violent extremism splinters families and communities. Indeed, in Fatuma’s case, it was the disappearance of her former husband that made her vulnerable to al-Shabaab in the first place. In the absence of strong family structures and social support systems, access to adequate education and healthcare are affected, which opens the doors to violent extremism. As a result, focusing efforts on strengthening familial ties is crucial in both preventing and countering violent extremism. In this way, Fatuma’s tale is one of promise. Since her return from Somalia three years ago, she has remarried and given birth to a boy, who is now one and a half years old. The new life and new family she has created have helped her to reintegrate into her community. They have also helped her emotionally, psychologically and economically – Fatuma currently works for her husband’s charcoal business. Given her experiences with al-Shabaab, as well as her relative social and economic stability in the aftermath, she would likely be well suited to this work. Tapping into the roles women can play to prevent violent extremism within their families and communities is crucial in building sustainable peace at the local level. With the necessary support from government, the community and donors, Fatuma could be part of a burgeoning community of women working to prevent recruitment into extremist organisations – and establishing themselves as ambassadors for peace in the process. Fatuma was one of three returnees interviewed in late 2016 by ISS researchers for the monograph Violent extremism in Kenya: why women are a priority. ISS Today has also published the stories of Khadija and Amina. The study was commissioned by UN Women Kenya. Those attending the first YouthConnekt Africa summit in Kigali, Rwanda, earlier this month, heaped praise on the country and its president Paul Kagame. Nigerian billionaire Tony Elumelu, who spoke about his foundation’s empowerment of African entrepreneurs, said Kagame ‘makes Africans very proud’. Other speakers included Vera Songwe, the newly appointed head of the United Nations (UN) Economic Commission for Africa, Chinese billionaire Jack Ma and South African mining magnate Patrice Motsepe. Upbeat discussions about youth employment, bringing power to Africa and using Africa’s vast arable land were among many such meetings held in Rwanda’s new conference centre, where the 27th African Union summit took place last year. Kagame has become something of a champion of connectivity, entrepreneurship and kick-starting Africa’s development. The youth conference also came at a good time for Kagame, who is running for a third-term re-election on Friday 4 August. It can do no harm to have your citizens witness the world lauding you as a visionary leader. Not that Kagame needs any extra support to win. As with the previous two presidential elections in 2003 and 2010, and the December 2015 constitutional referendum to ensure Kagame a third term, there is little opposition to him this time. Those who might have been able to challenge him have been removed or frightened away. The warning against those who might dare oppose Kagame and the ruling Rwandan Patriotic Front came early on in his presidency. But it was accentuated when former president Pasteur Bizimungu was jailed in 2002 for allegedly fomenting dissent after he tried to form a political party. He was pardoned in 2007. Victoire Ingabire, who opposed Kagame in the 2010 elections, is still in jail, having received a 15-year sentence in December 2013 for wanting to overthrow the government and promoting ‘genocide ideology’ – a favourite term to discredit dissenters in Rwanda. In the run-up to this week’s vote, three of the five candidates who were planning to run against Kagame were disqualified. Among them was the 35-year-old Diane Rwigara who was told some of the 600 names on her list of supporters – a prerequisite for independent candidates to participate in the poll – were fake. A new Amnesty International report details human rights abuses and the atmosphere of fear in which these elections are being held. Opponents to the regime regularly disappear, claiming they have been tortured; independent non-governmental organisations find it difficult to operate and the independent media is being closely monitored, the organisation says. Is this the price to pay for the development miracle? Are unchecked power at the top and political repression the necessary prerequisites for stability, economic growth and ‘making Africa proud’? But some researchers and commentators, including Himbara, are questioning the figures of Rwanda’s GDP growth and poverty reduction since the end of the genocide in 1994, saying they are based on false calculations. Statistics are particularly important as Rwanda remains something of a ‘donor darling’ 23 years after the 1994 genocide. Up to 40% of Rwanda’s budget is made up of foreign aid – according to Himbara’s figures the highest level of donor dependency per capita in East Africa. Rwanda’s trade deficit is growing and annual per capita income is also lower than Kenya and Tanzania, he says. Aymar Nyenyezi Bisoka, a post-doctoral fellow at the Louvain School of Political and Social Sciences who has done research in Rwanda’s rural areas, says even if some of the official figures add up, there are many questions about the quality of government assessments and whether people are free to respond truthfully. Even when it comes to political freedoms in Rwanda, some organisations prefer to buy in to the official line. A study by the Wits School of Governance in South Africa and the Africa Regional Office of Open Society Foundations says ‘democratic culture’ in Rwanda is seen to be greater than in South Africa, Ghana, Nigeria, Zambia and Ethiopia. ‘Democratic culture’ pertains to ‘the necessary legislative, social and policy frameworks to support and protect multi-party democracy, open debate and peace’. But researchers say civil society organisations in Rwanda – who are tightly controlled by the state – were hesitant to participate in the study. And when they did, respondents to the Wits survey gave the Rwandan government full marks on almost every score. Donors and international organisations could argue that good statistics are hard to come by in many parts of Africa. They could claim that at least in Rwanda there’s some push by the government to ensure economic growth, rather than merely being a predator state that rules solely through corruption and violence, with no effort to uplift the poor. Kagame clearly has nothing to fear from most observers and donors, especially within Africa. At the last summit in Addis Ababa he was elected chairperson of the AU for 2018 – no one even considered the possibility that he would no longer be Rwanda’s president. According to the constitutional amendment in Rwanda, Kagame may be able to stand for president again in 2024 and then serve another two five-year terms. To stay in power, he will have to continue surrounding himself with star-studded supporters and prevent any serious dissent from getting in his way. Ironically, with more connected Africans seeking greater freedom of expression, this might become more difficult to pull off as time goes by. Discrimination, unemployment and conflict set migrants on a perilous journey through war-torn Yemen to the Gulf. Despite conflict and humanitarian catastrophe in Yemen, the country remains a destination for some Somali and Ethiopian migrants who risk kidnapping, torture and deportation trying to reach labour markets in the Gulf. Tens of thousands of migrants use a vast network of smugglers to move across harsh terrain, endure a perilous sea voyage, and then travel through war-torn Yemen and across one of the world’s most heavily-monitored borders. New research by the Institute for Security Studies (ISS) indicates that some of these migrants may be recruited into armed groups, hired as mercenaries, or conscripted into forced labour during their journey. Many are kidnapped upon arrival in Yemen. Many more migrants travel from the Horn of Africa to Yemen and Saudi Arabia than to Europe. A record 117 107 arrivals were documented in Yemen in 2016, 83% of them Ethiopian and 17% Somali. Ethiopians pay smugglers to guide them through Djibouti or Somalia to coastal departure points, where they are joined by Somali migrants. On arrival in Yemen, smugglers facilitate movement across the militarised Saudi border. In Somalia, smugglers facilitate direct passage to Saudi Arabia by linking migrants with new sets of smugglers in Yemen. Migrant smuggling is big business. Research carried out in 2016 by the Global Initiative against Transnational Organized Crime for the ISS indicated that migrants paid US$ 200-500 to journey illegally to Yemen via Djibouti. The migrant smuggling industry in the Horn of Africa was conservatively estimated to be worth around US$ 15 million per annum in 2016. This transnational connectivity between multiple groups of smugglers suggests coordination between criminal opportunists along many different routes. Ethiopian and Somali migrants who arrive in Saudi Arabia without papers find work in the informal economy. Considering that people continue to make the journey despite crackdowns and deportations, why do they go? Political discrimination and lack of economic opportunities are the main reasons Ethiopian migrants give for making the journey. The drivers of Somali migration to the Yemen are different, with migrants citing conflict, recent famine, and employment opportunities in Yemen and Saudi Arabia. For Ethiopians transiting through Somalia, the journey to Yemen begins with travel to the Somaliland border, where migrants connect with smugglers who bribe border officials and move people through Puntland to the coast, where boats depart for Yemen. Smugglers in Puntland say police are complicit in this leg of the journey, receiving bribes at checkpoints, or selling unaccompanied migrants to smugglers. Migrants who do not pay are held for ransom, with physical abuse used to extract payments from families or friends back in Ethiopia, or forced to work until they pay their debt. In some cases, local law enforcement officials and community militia are complicit and hand migrants over to violent smugglers. Some migrants do parts of their journey on foot, without a smuggler, and may fund their journey by working along the route. They are at risk of arrest or kidnapping. Smugglers on the route through Djibouti describe a lucrative and permissive smuggling environment. Transit costs are estimated at US$ 200 for each migrant, of which the smuggler may pay bribes up to US$ 30 at each of four checkpoints, before the migrants board a boat for Yemen. Once they reach Yemen, migrants must make new financial arrangements with local smugglers and may find themselves detained by armed groups who connect them with smugglers in exchange for ransom payments. Migrants have told of being thrown off the boats and made to swim ashore to avoid detection. A security official in the smuggling hub of Hodeida in Yemen reported a chain of smuggling networks including military officials, local sheikhs, members of parliament, public prosecutors, law enforcement, and customs officials. Other sources describe smugglers coordinating with local government officials, police officers, coast guard members, soldiers and Houthi rebels stationed at multiple checkpoints across the smuggling routes, as well as Saudi military at border crossings. Government officials are often eager to frame the arrival of unwanted irregular migrants as a state security issue, and have every incentive to portray migrants as drug couriers, hardened criminals and foreign fighters. Somaliland intelligence officials have referred to Ethiopians being recruited or forced into the war in Yemen. Officials in Puntland expressed concern at the overlap between migrant smuggling networks and arms traffickers who return to Puntland with contraband, including weapons that can be sold to local militias or find their way to al-Shabaab and pro-ISIS fighters. Migrant smugglers operating in Yemen are believed to be involved in other smuggling activities, including oil derivatives, cigarettes, weapons, alcohol and cannabis. Migrants are also believed to be used as drug couriers, carrying qat, cannabis and heroin, in exchange for reduced smuggling fees or free passage. The movement of migrants is complex – it is transnational, coordinated across borders and relies on both corrupt state structures and organised crime groups. Despite tough conditions in the destination states of Yemen and Saudi Arabia, conditions and employment prospects back home in Ethiopia and Somalia are sufficiently worse to justify migrants’ dangerous journey to the Gulf. This social, economic and political phenomenon must be considered by donors and bilateral partners working in the Horn of Africa. Policy makers should also recognise that the state may not be the most credible actor in addressing the issue of migrant smuggling. Is South Africa facing a food security disaster? Population growth, lagging food production and climate change threaten food stability. A rapidly growing population in Southern Africa means an increasingly higher food demand. And although domestic food production is expected to rise over the next few decades in response to this need, it is unlikely that the increases will be able to keep pace. As a result, food demand will outstrip domestic food supply. A recent report from the African Futures Project shows that the widening gap between domestic food supply and demand could have serious consequences for food stability. The region’s population is expected to increase by 60% (116 million people) over the next 23 years, overtaking growth in the agricultural sector. Without drastic improvements in food production, the region will have to rely on food imports more and more. It is forecast that in 20 years’ time, nearly a third of all food needed in Southern Africa will be imported. This reliance on agricultural imports will make people more vulnerable to food price spikes and climate shocks (such as floods or drought) – and ultimately, more frequent domestic food shortages. This doesn’t necessarily mean that Southern Africa will experience a rise in hunger – but it does mean the region is likely to be less food stable. That said, if countries in Southern Africa can improve agricultural production or reduce rapid population growth, this reliance on agricultural imports could decrease. Given the effects of rapid population growth on both poverty and stability in the region, stemming population growth should be part of a strategy to both ensure long-term development and mitigate growing food instability. Slowing population growth – through improved family planning and/or increased female secondary education – would help reduce the pace of food demand increases. But even with reductions in population growth (a long-term strategy), the region still needs to increase food production to ensure food stability. This can be achieved in two ways: increasing land under cultivation and/or improving average yields. A more sustainable approach would be to boost agricultural yields. Agricultural yields within the region are considerably lower (4.2 tons per hectare) than the global average (6.1 tons per hectare). Policies that promote the use of fertilisers, improved seeds and pesticides, provide training on soil management or expand the amount of irrigated land could help close this yield gap. Investing in sustainable agricultural practices and improved inputs to boost yields will be especially important in light of the possible effects of climate change in the region. The latest research from the Intergovernmental Panel on Climate Change suggests that much of Southern Africa is likely to get warmer and have less rain in the coming decades. These types of changes will have significant effects on agricultural yields in Southern Africa, especially for small-holder subsistence farmers. Vulnerability to food shocks, whether it be through increased import dependence or factors relating to climate change, could spell a food security disaster for Southern Africa. This means that increasing production and shifting towards more sustainable agricultural practices should be at the forefront of the region’s efforts in attaining food stability. The stakes for public safety have never been higher in South Africa. Last year saw 3 119 more murders and 31 000 more armed attacks in the country than five years ago. Public confidence is at an all-time low, with 77% of all households believing that corruption has worsened over the past three years. The problem isn’t a lack of resources, skills or necessarily the ability of officers, though. The problem is incompetence and dishonesty at the highest levels of policing which have profoundly weakened the ability of the country’s crime-fighting institutions to tackle corruption and violent and organised crime. This boils down to the exceptionally poor appointments for the top spots in the South African Police Service (SAPS) and the Directorate for Priority Crime Investigation – the Hawks. And at a time when the country most needs strong leadership, both these positions – the SAPS national commissioner and the head of the Hawks – stand vacant. South Africa can no longer afford poor appointments to these two posts. For this reason the Institute for Security Studies (ISS) and Corruption Watch have joined forces to highlight the importance of appointing the best people to head these institutions. The campaign is a call for people to be aware and to urge the leaders responsible for the two appointments – President Jacob Zuma and Police Minister Fikile Mbalula – to implement the policies as set out in the National Development Plan (NDP). The recommendations of the NDP on the process for appointing the SAPS national commissioner and deputy commissioners were adopted by the African National Congress (ANC) and the cabinet in 2012. The decision to appoint the SAPS national commissioner lies in the hands of Zuma, and that of the head of the Hawks will be made by Mbalula. The NDP states that the appointment of the national commissioner and deputies should be on a competitive basis against objective criteria, as this would enhance the incumbents’ standing in the eyes of the community and ‘increase the respect accorded to them by their peers and subordinates’. The ISS-Corruption Watch campaign has laid out a 10-point process for ensuring that an appropriate selection panel is established to develop clear minimum criteria for the post, and to develop a shortlist of candidates from which the president and police minister can select the best people to lead the SAPS and Hawks. If there is the political will to improve the process for appointing these two leaders, then the above proposal could be implemented with shortlisted candidates available for selection by the end of 2017. The NDP identified ‘serial crises of top management’ in the police as a fundamental shortcoming for public safety in South Africa. This was even before the ongoing bombardment of details of state capture by the president’s friends, the Guptas. This indicates that corruption is far worse than many of us realised, which severely compromises the state’s ability to solve the problems of unemployment, poverty and inequality. Poor police commissioner appointments have reversed the gains made since democracy was achieved. For example between 1994 and 2012, murder levels in South Africa dropped by 54%. Between 2009 and 2011 – under dedicated political leadership and capable operational police commanders – armed attacks on homes and businesses, and car hijackings in Gauteng province decreased by 20%, 19% and 32% respectively. South Africa needs to get back to a place of good leadership. The SAPS budget has increased by 50% since 2012 to R87 billion. Between 2002 and 2012, the organisation grew by about 68 000 posts. With almost 195 000 employees, the SAPS is now one of the largest policing agencies in the world. Despite the increase in resources and the expertise, SAPS performance over the past five years has deteriorated significantly. The criminal prosecution of the suspended head of crime intelligence, Lt-General Richard Mdluli, for a variety of crimes, has profoundly weakened SAPS intelligence capacity. This means that the SAPS cannot direct its resources effectively against those who commit serious violent crimes. Due to ongoing problems with the detective services, the detection and prosecution rates for murder and robbery have declined; and as a result, these crimes are on the rise. It is much easier to be involved in violent crime and corruption today than it was before Zuma took office as president. The police national commissioner is an immensely powerful position that determines the extent to which the organisation is able to achieve its objectives. Only the SAPS head can ensure that Mdluli is held accountable. Similarly, the head of the Hawks can determine which powerful individuals – be they corrupt cabinet ministers or business people – are thoroughly investigated for their crimes against society. The people next appointed to the two posts will probably lead these organisations for at least five years. Appointing the best possible police leaders could see a substantial improvement in the safety of all people living in South Africa. However yet another poor appointment, as has been the case with the previous three permanent SAPS national commissioners, will result in more people being murdered and attacked in the streets, their homes and places of work. The choice faced by Zuma and Mbalula is a stark one: implement the recommendations of the NDP and act in the public interest, or follow the well-worn path to failure, with a continuing decline in policing and public safety.